There is something otherworldly about an old Norman church. A sanctity, certainly; the trappings of Christian worship both exude and compel hushed reverence. A sense of community perhaps, as the Anglican Communion struggles to fill the gaps left by austerity, providing food banks now alongside village fetes and raffles. But there is always something beyond that; something in the very fabric of the building, buried deep in the centuries old stone. The best of those churches are keepers of ancient tales, conduits that speak of England’s green hills and forests and what lies beneath. I was married in one such church, parts of which date from the 12th century, set on falling ground to the west of my home town. The churchyard contains St Withburga’s Well, supplied by a spring that is said to have issued forth from the burial place of Withburga, who laid the foundation of a church and convent there, the first Christian settlement in the area in the year 654. She lived and died in an era of unprecedented change. Her father was Anna, King of the East Angles, pagans who came to the British Isles with iron and fire, who believed the green church of the woods heard their prayers more clearly than any monument of stone. But it is stone that has proved the most enduring store of the pagan story. At the north side of Gosforth village on Wasdale Road, Cumbria, stands the ancient parish church of St Mary and, in the churchyard the equally ancient and famous Gosforth Cross. This magnificent cross has stood on the same spot for over a thousand years. 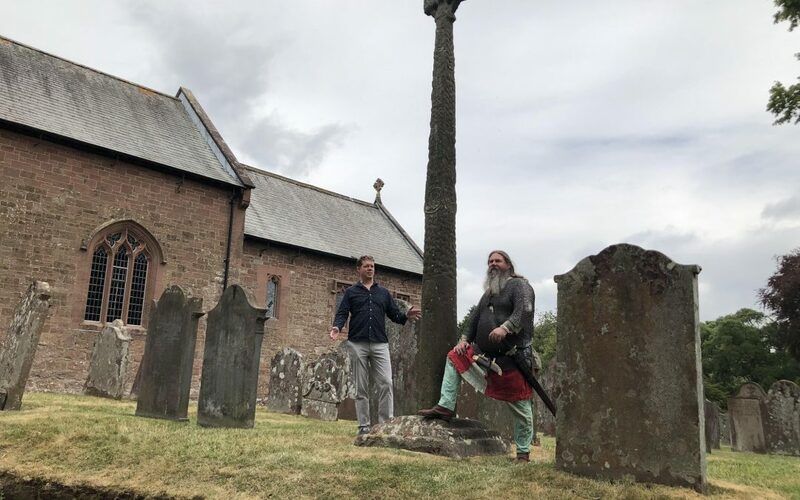 The monument is a very tall, slender cross made from red sandstone, richly decorated with some very exquisite carvings of Norse gods, Christian symbolism and mythical beasts. It is at the heart of the All Father Paradox and takes pride of place on the cover. I chose this cross as my central motif for the novel because, like Withburga’s well, it has been witnessed to endless change. We can only imagine who built it and why, or what manner of men have toiled in its shadow over the course of that millennium. Christianity was in the north-west of England long before of course. Roman soldiers had spread the faith, and left traces when their armies were withdrawn. Wandering saints and preachers came up the Irish Sea from Rome, such as the man later venerated as St. Patrick or Bega of St. Bees, bringing their religion to the Anglo-Saxons who settled there. There is no definitive proof of a church in Gosforth before the Viking Age, but it would have been Celtic, made of wattle and daub, and it too, would have been focused around the local holy spring. The Vikings swept through Britain with series of invasions throughout the 10th century, and for a time controlled the area of northern England known as Danelaw. Names of towns, roads, and families still in existence today attest to this Scandinavian stronghold. But, like the Angles before them, it seems as though the conquerors were quickly conquered by the customs and beliefs prevalent in their new land. The Gosforth Cross speaks to this unique juncture in time, a world halfway between the pagan and the Christian. It was first identified in 1886 by the amateur antiquarian Charles Arundel Parker. His findings were a sensation in an age obsessed with Vikings (Wagner’s Ring Cycle debuted just ten years before), the Victoria and Albert Museum quickly had a replica made. Parker demonstrated that the cross showed scenes described in Norse myth, such as Loki bound, the god Víðarr tearing the jaws of Fenrir, and Thor’s failed attempt to catch Jörmungandr, the Midgard Serpent. I’d written about the cross having researched it online – I went so far as to commission a local photographer to go and snap some shots of it – but I’d never seen it in person. The cover artist, Jeremy Mohler, had sent me his first concepts in the spring of 2018. He’d quickly zoomed in on the cross and the conflict between the two protagonists as the best way to grab people’s attention. It captured the scene brilliantly – the coastal gusts of wind, the otherworldly hues, the sense of an oncoming storm. But before the All Father Paradox was published in October, I knew I had to see the Gosforth cross for myself. So, in July that year, my wife, son, daughter, mother and step-father all travelled up to the Lake District. As soon as I stepped off the plan, I realized, I didn’t just want to imagine the cover scene, I wanted to recreate it. So, I reached out to a local Viking re-enactor, the splendidly named Science Viking (look him up! ), and with my wife on photo duty, we did out best to recreate Jeremy’s work. It was an oddly cyclical series of events, but very much fitting for the themes of the book. Of course, we couldn’t conjure Yggdrasil or call forth Huginn and Munin, but it was a fun photoshoot all the same!